Understanding f-electron elements has been an important problem in condensed matter physics for many decades. The challenges have involved developing a first-principles theoretical framework due to the fact that f electrons can exhibit either localized, highly correlated or itinerant behavior. In addition, f-elements are characterized by multiple low-energy states that make it difficult to correctly identify the ground state, a prerequisite for any theoretical method. Cerium under pressure has been a particular puzzle. It undergoes an isostructural volume collapse at 1.5 GPa at room temperature, a feature that has caused difficulties for existing models. The most serious discrepancy among competing models of f-electron behavior is the evolution of the magnetic moment of the Ce atom across the volume collapse transition. Therefore, a measurement of the magnetic moment with pressure should help validate one model over others. 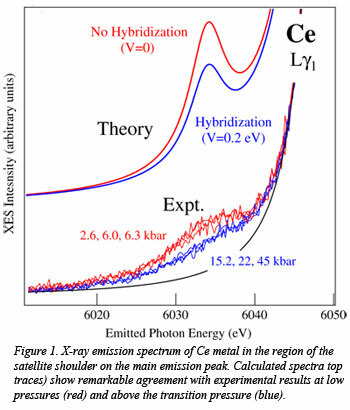 Recently, a research group from led by Magnus Lipp (LLNL), and including colleagues from Stanford University and Paul Chow and Yuming Xiao from HPCAT carried out x-ray emission measurements on Ce metal up to 4.5 GPa designed to probe the magnetic moment of the sample. The key feature of the emission spectrum is the satellite shoulder on the main emission peak that represents interactions between 4f, 3d and 2p electrons in the atom (Fig. 1). The group showed that a theoretical model that explicitly accounts for the hybridization of 4f states with higher-lying conduction band states represents the physics correctly and produces excellent agreement between the experiment and the Kondo model of f-electron behavior as opposed to the Hubbard-Mott model. The approach outlined in the account of this work, published recently in Physical Review Letters, will be relevant for other f-electron systems and will help expand the theoretical descriptions of this important class of materials [M. Lipp et al., Phys. Rev. Lett 109, 195705 (2012)].